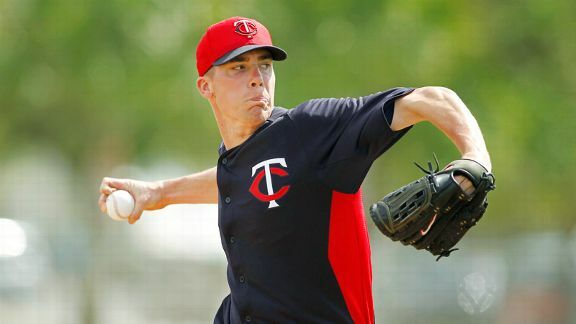 They keep telling RHP Alex Meyer that he’s a Minnesota Twin, but he just keeps striking guys out anyway. There is no sure-fire recipe for success in the big leagues; success in the big leagues is not a cake, nor does it resemble a cake in more than a couple cursory ways. Instead, success in the major leagues seems to be attainable by a number of different methods. If one is a starting pitcher, one could conceivably succeed in myriad ways. One could, for instance, use superior command to generate weak contact in spite of a lack of overpowering stuff; creating an abundance of ground balls that are hopefully far less damaging to the score of your team. If one were a pitcher in the Minnesota Twins organization, you could be forgiven for having believed that this was actually the only avenue by which one would be allowed to succeed. Alex Meyer, the top pitching prospect in said Minnesota Twins organization, continued his quest to dispel you of these inaccurate notions as, on Friday, he racked up 7 Ks across 6.1 innings and gave up just a walk and a single hit (a double down the right field line off the bat of Yankees farmhand Addison Maruszak). Hot Video Highlights after the jump! The 6’9″ right hander mixed and matched his full arsenal on the night and seemed to be firing on all cylinders into the seventh inning against the Scottsdale Scorpions. His mid-season shoulder issues seem to get progressively further into the rear-view mirror and his command continued to improve and compliment his considerable velocity, throwing 48 of his 76 pitches for strikes and lowering his Arizona Fall League ERA to a tidy 2.74. Despite what a graphic during the broadcast may have you believe, Meyer has not exactly been known for having ‘plus-plus command.’ Despite a very impressive stretch thus far in the AFL, in 70 innings at AA this year he walked 3.7 batters per nine innings, a touch above the Eastern League’s 2013 average of 3.5. While its not enough to consider a red flag, its important to note that he will need to continue the improvement he’s showing in the AFL to be acceptably near the 2013 MLB average of 3.1 by the time he makes the Bigs. Meyer is a fastball-slider guy with a developing knuckle-curve and change. His hard stuff is amongst the best in the minors when it comes to spin rate, as evidenced by some AFL sample data released by the Trackman team last week. They state that Meyer’s FB+SL spin rate ranks him 8th in the AFL, and that his slider spins over 400 more times per minute than average. A high fastball spin rate, says Trackman, correlates highly with a high swinging strike percentage, which continues to back up the case being made for Meyer’s chances for success. Additionally, the drawback of the higher spin rate being less groundballs should not hurt Meyer too much upon his graduation to Target field, as ESPN tracked Target as the third-best park for preventing dingers in 2013. At 1:27 in the embedded video, Meyer strikes out Camden Maronlooking on a filthy 83 mph changeup. One televised AFL start is scarcely much of a sample size but Meyer seemed able to consistently throw the change for strikes, and a 13 mph FA-CH separation is nothing to sneeze at. His arm speed on the pitch is nicely deceptive, though he seems to fiddle with it’s grip for an extra moment when he sets it up at times. Concerns about Meyer, as they have since his earliest days in the minors, seem to center around the consistent repetition of his delivery. On Friday night he continued to show some of the same issues that have been mentioned in scouting reports throughout his time in the minors. He continues to throw too much across his body which causes him to fall off his pitches a bit to his glove side; this causes some wonky looking balance at release and costs him fastball command and extension to boot. Further impacting his issue with extension is his short stride (considering his long frame, this should be a natural strong suit) which, when coupled with his cross-body delivery, almost negate the considerable natural advantage he gains by being nearly seven feet tall. The cost of effective velocity from the less-than-perfect extension may be barely felt now, when Meyer possesses a no-seam fastball with great movement that touches 98, but proper extension often eases a pitcher through some velocity loss as they age by letting their pitches ‘play up.’ Meyer throws 96 and it looks like 96 and that is good; it’d just be better if it looked like 99 as it should at his height. The Twins won’t rush him, it would take a number of surprises to see Alex Meyer crack the opening day rotation in 2014, but all signs point to him being ready to do so nonetheless. For a team in the Twins’ position, with contention still at least a season away, this becomes a business decision. Meyer will continue to hone his craft until one day in June, completely coincidentally, he will become really ready, just in time to miss the Super Two cutoff. All in all, Alex Meyer has continued to provide the Twins organization with a reason for hope, for strikeouts at the end of the tunnel. For an organization that ranks dead last in baseball since 2010 in K/9, that can only be a good thing. Posted on November 10, 2013, in Outing Report, Starting Pitchers, Top Prospects, Twins and tagged Alex Meyer. Bookmark the permalink. Leave a comment.